Gasoline should be cheaper than it is today. It will likely fall further in the next few weeks. Oil dropped from about $50 a barrel down to around $30 in the past 3 months. That should cause gasoline to drop further than it has. 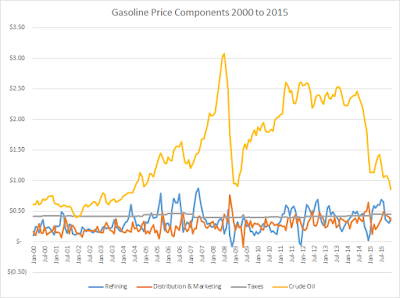 But theres some delay between gas price drops and drops at the pump due to the time to refine and distribute and then sell gas at retail. We could see gas hit around $1.50 level within a month. Anyway... that line of thinking is what lead me to the information below. 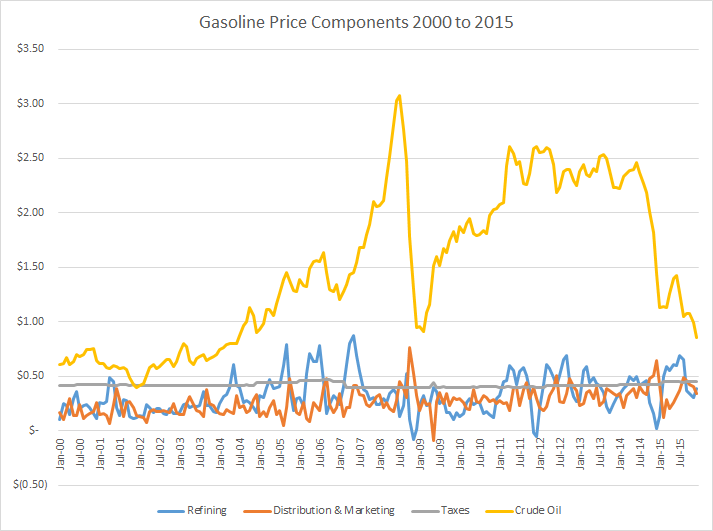 EIA has a breakdown of the component prices of gasoline for refining, distribution, taxes and oil. Taxes are the only constant. Refining and distribution bounce up and down a bit. Oil is main factor that causes the larges swings in the retail prices.